Is Venice "too touristy"? Is a Venetian vacation more expensive than a shopping excursion to Valentino? Is this nautical Never-Neverland about to sink like the Titanic? Indulge us as we bring a common-sense perspective to the most frequent misapprehensions about Venice. Myth 1: Venice is completely overrun by tourists. 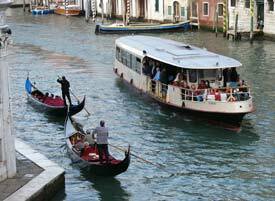 If you're a daytripper arriving by car or train at 9 a.m. on a Sunday in August, you'll be convinced--with some justification--that Venice is a veritable Pied Piper among tourist towns. Travel out of season. Even the depths of winter are mild by the standards of New York or Chicago, and hotel rates are often half of what you'd pay in summer. The best time to come is from November to March, when most tourists have migrated south or to the ski slopes. Visit during the week. Venice is just a few hours from Milan and Rome, making it an easy target for the weekend-getaway crowd. Pick a quiet neighborhood. In high season, tourists on day excursions jam the routes from the Piazzale Roma to San Marco. You'll find fewer people (and hardly any tour groups) when you get off the main pedestrian thoroughfares. Myth 2: Venice is too expensive. Too expensive compared to what? A double room in a three-star hotel costs no more--and possibly less--than comparable accommodations in Zürich, London, Chicago, or Boston. If you're on a tight budget, avoid hotels near the Piazza San Marco and investigate other possibilities such as convents or youth hostels. See our Where to Sleep in Venice article for advice and accommodation links. Meals needn't be costly, either. Pizzerias are easy to find, and stand-up bars offer sandwiches and other light fare. Best of all, exploring Venice on foot won't cost you a cent--and distances are so short that just about everything is within walking distance. Myth 3: The canals stink. Industrial pollution is a problem in Venice, just as it is in most urban areas. Still, the Venetian lagoon remains one of the richest natural habitats for fish, birds, and plant life in the entire Mediterranean region, and both it and the city's canals are cleansed twice a day by tides from the Adriatic Sea--which is just as well, since much of the city's sewage is dumped directly into the canals. Myth 4: Venice is the new Atlantis. True, Venice is sinking--but at a fairly modest rate. Capping of artesian wells in Venice and nearby mainland towns has slowed the subsidence to a quarter of an inch per year. The primary threat to Venice isn't an imminent "Slurp!" from the clay beneath the lagoon; it's flooding from the acqua alta or high water that occurs when certain maritime and meteorological events coincide (e.g., low atmospheric pressure combined with an unusually high tide and a scirocco wind that pushes water up the narrow Adriatic Sea and into the Venetian Lagoon). When the acqua alta warning sirens blow, Venice city workers lay down elevated walkways and the natives haul out their galoshes. But don't worry--you're unlikely to drown in bed. And in any case, there's an ongoing project to raise pavements in low-lying areas of the city to minimize soggy sidewalks. In the decades and centuries ahead, climate change and rising seas may threaten Venice's existence, but for now, you can leave your diving gear at home. Myth 5: Beware of thieves on motorscooters. This warning may be valid in Rome or Naples, but you'll encounter few thieving Vesparazzi in Venice. For one thing, wheeled vehicles (except handcarts and baby carriages) are illegal in most of the city. Still, if a tough-looking character charges toward your gondola on a JetSki, hang onto your purse or wallet. And watch out for pickpockets, who flock to Venice and other major tourist cities of Europe during high season.